Welcome to our department for Castle Climbing Frames. While the following designs are similar to our domestic range, these models are certified for commercial use. In other words, they conform with EN1176, which is the European safety standard for public playgrounds. This standard requires thicker timbers, more robust accessories and for the frame to be set into concrete. Based on a modular system, you are free to create your own unique design. Modules also have the advantage of being cheaper to buy and faster to install. In addition, because we can guarantee they fit together, we reduce the overall project risk. We have been supplying and installing playground equipment since 2003. Below are some examples of our Castle Climbing Frames, however, there are many more options. So, if you have any questions or require a particular lay-out, then please do not hesitate to contact us. The Adventure Fort 5 is a small Fort Playground, with two Towers and a lower deck height of 1.2m (4′) from the ground. 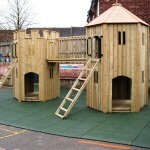 A large Fort Playground, with three Towers and a deck height of 1.5m (5′) from the ground, suitable for commercial settings, such as a school or pub garden. Many accessories included and layout is flexible. 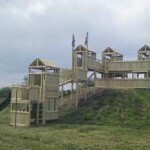 The Adventure Fort 3 is a larger Fort Playground, with four Fort Towers and a deck height of 1.5m (5′). 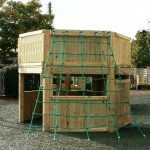 The Adventure Fort 2 is a larger Fort Playground, with four Towers based around a deck height of 1.5m (5′) from the ground. 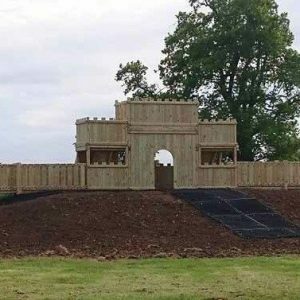 The Adventure Fort 6 is a larger Fort Playground, with four Fort Towers and a deck height of 1.5m (5′). The Adventure Fort 4 is a larger Fort Playground, with four Fort Towers and a deck height of 1.5m (5′).